Back For Seconds: Ice Cream Scoop Cookies - Fabulous Foodie Fake Outs! 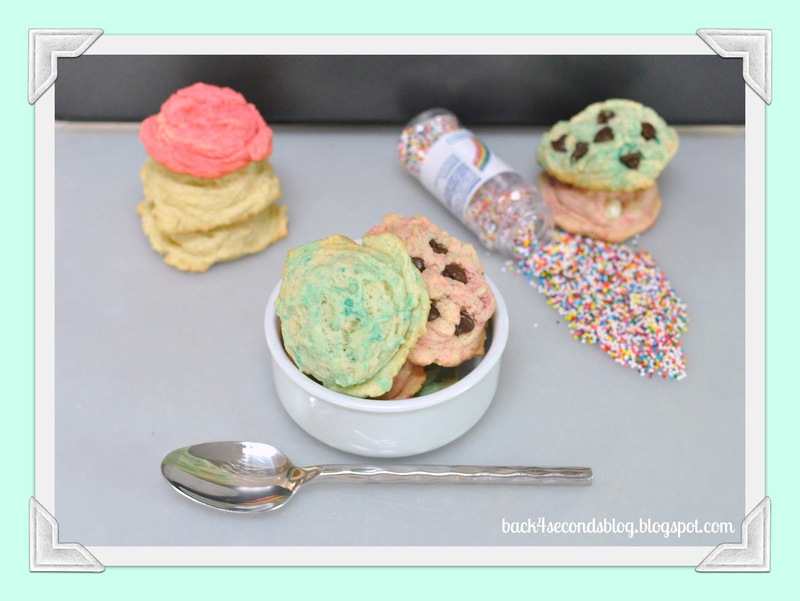 Ice Cream Scoop Cookies - Fabulous Foodie Fake Outs! I am SO excited for today's post! Me and some of my uber talented blog friends are having a party and you're invited! We are sharing some fabulous fake-outs and I can't wait for you to see what everyone cooked up! When it's super hot outside I crave ice cream - big time. And it's been hot here this summer, so you would be correct in assuming that I've eaten a lot of ice cream. Even when baking cookies, ice cream was my inspiration. 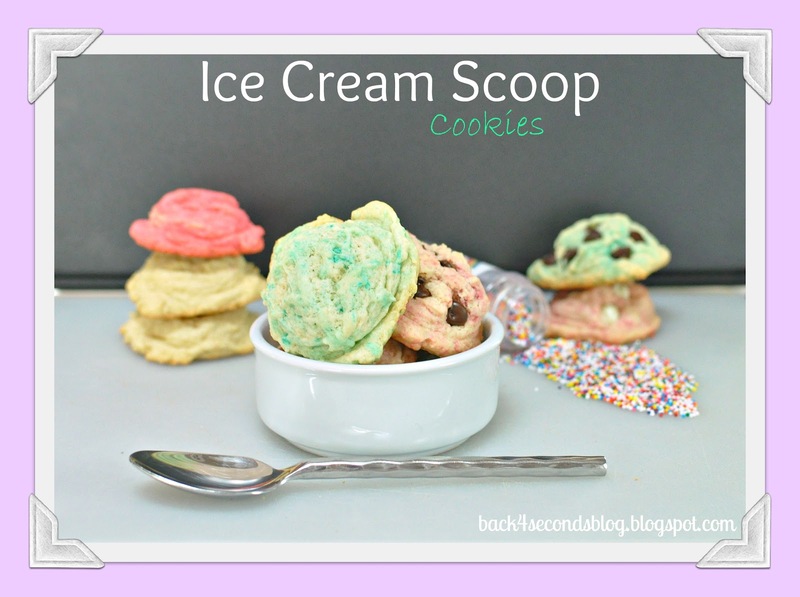 Aren't these scoops of ice cream cookies cute?? This recipe is so fun because you can divide the dough and add whatever colors and flavors your heart desires. I made three varieties: Coconut chocolate chip, Raspberry Chip, Bubblegum, and Vanilla. They were all so yummy but the flavor possibilities are endless - what kind would you make? What flavor of ice cream is irresistible to you? In a large mixing bowl beat butter, oil, and sugar. Add in vanilla and eggs, one at a time beating after each addition. Slowly add in baking powder and flour until well combined. Divide dough into as many flavors/colors you want to make and add the appropriate add ins. (If adding chocolate chips, do so after scooping to give a clean look.) Scoop out heaping spoonfuls with a mini ice cream scooper onto a baking sheet and freeze for an hour. Once frozen bake at 350 for about 15 minutes. Cool completely before storing in an airtight container. Enjoy! Now go check out these other Fabulous Foodie Fake-Outs and say "hi" for me! Stephanie, What fun cookies! They look just like scoops of petty colored ice cream! Thanks for being the brains behind and the organizer of FABULOUS FOODIE FAKE OUTS! This was so much fun! Each girl made some great fakes and they all look so delicious! Thanks for including me among all these foodies! These turned out adorable - i love them!! thank you so much for organizing this party, stephanie - such fun! I love these! Perfect for an ice cream party for those who don't care for ice cream(are there really people in this world who don't like ice cream?) I can see these as a great centerpiece, reminding me of the Kitchen sink sundae you could order, one scoop of every flavor. These are even better though. All the wonderful flavor without the melty mess. Thanks for putting this Foodie Fakeout together, I love all the great ideas. These are adorable! I love how they totally look like scoops. Such a fun theme! These are too stinkin' cute, girl! Love me some ice cream and cookies, too!! These are too stinkin' cute! Love me some ice cream + cookies! Those are adorable! I love the idea of making all different flavors! I am feeling a little boys activity sometime soon! They love to bake with me. :) thanks for coming by and visiting, I loved being part of your first social! Too bad I don't have a foodie fake out. These are so darn cute! They could be so much fun with the kids! Thanks! These are awesome. It looks like I am always back here! Stopping by from Marvelously Messy. Hope to see you at True Aim! i saw these somewhere on pinterest, definitely on the to do list. Great job!! I loved seeing all these foodie fake-out posts! These cookies are great! Thank you for sharing at Mom's Test Meal Mondays! These are soooo cute!!! What a fun summertime cookie! Fabulous idea!!!! I absolutely love this party idea! Great cookies! What a fabulous party idea!! Great cookies! How fun are these? My boys would LOVE them!!! Thanks so much for coming out to the party at Clean and Scentsible. I'll be featuring these on my Facebook page. Enjoy the rest of your week! Adorable! Love these, very creative idea. Thanks for sharing! Looks delicious!! Another great recipe to try! this would be such a fun spin for an ice-cream parlor party! These are so perfect. Another wonderful creation! These are too cute. And perfect for a summer dessert. Thanks for sharing on Tout It Tuesday. Hope to see you tomorrow. Looks so delicious! This would be so cute for a birthday party!